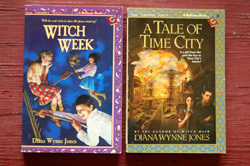 JANE: Alan, last time you pointed out that most of Diana Wynne Jones’ books stand alone. Did you know that one of the books we discussed, The Dark Lord of Derkholm, actually does have a sequel? ALAN: Yes, I do. It’s called Year of the Griffin. I must confess I was surprised when I came across it because I always felt that The Dark Lord of Derkholm stood alone very well indeed. What did you think of it? JANE: At first I was hesitant, because, like you, I thought the prior book stood alone quite nicely. However, when I read the jacket copy and learned it was set eight years later, I was tempted. I soon found myself completely absorbed. Year of the Griffin is a fine novel in and of itself, but it also provides Diana Wynne Jones an opportunity to take a swipe at a form of Fantasy novel that, especially at the time this novel was written, was being seriously over-done. By this I mean the Wizard School Story as popularized by Harry Potter, and imitated repeatedly, usually without J.K. Rowling’s flair. JANE: Ah, yes… I’ve read that one. It’s very good. Now, I enjoyed the Harry Potter novels, but Hogwarts always seemed boringly homogenous to me. Not so the school in Year of the Griffin. Students include a dwarf, a half-marsh dweller/half-human, a pirate, a youth from the vast deserts, and Elda, the griffin of the title. Elda, by the way, has perfectly human parents. Only Diana Wynne Jones could make this work, but she does. ALAN: Well of course she does. She is Diana Wynne Jones, after all! JANE: And in the course of weaving her wild tale (which includes assassins, armies, rogue monsters, an animate coat rack, and a trip to the Moon), Diana Wynne Jones manages to make some pretty cutting comments about educational systems that seem to exist for no other reason than killing the imagination and graduating students who are fit only to perpetuate the system. Oh, yes, and providing venues for bored professors to teach as little as possible, because all they really want to do is research into their pet projects. My only complaint was that I felt the novel could easily have been a third longer without the least bit of padding. ALAN: What an unusual complaint! For the vast majority of modern fantasy novels, the reverse opinion applies. Most of them need to be considerably shorter since they consist mainly of padding! But there you go – Diana Wynne Jones always refused to fit the mould. Did you know that she’s written SF as well as fantasy? JANE: I do indeed. In several of her books – Archer’s Goon, A Sudden Wild Magic – Diana Wynne Jones melds the two quite successfully. ALAN: Yes, she does happily cross backwards and forwards between the two genres. But A Tale of Time City is definitely SF. It tells the story of Vivian Smith, who is kidnapped while being evacuated from London during World War II. She gets caught up in a struggle to preserve history and, as always, Diana Wynne Jones handles the ideas of time paradoxes and causality very cleverly and wittily. JANE: I like A Tale of Time City for many reasons, not the least of which is how well the characters – some of whom are children who have acted impulsively, some of whom are adults who (in the hands of a lesser author) would simply nag and reprimand. ALAN: One of the things I really like about Diana Wynne Jones is that the relationships between the adults and children in her books are often very healthy ones based on mutual respect. It gives her characters a maturity that seldom exists in books by other writers. But back to specifics! The Homeward Bounders, like the titles you mentioned above, sort of straddles the borderline between SF and Fantasy. It is a parallel worlds story (a concept that Diana Wynne Jones seemed to find fascinating. She returned to it again and again). The parallel worlds are game boards for strange beings that use them to play war games. When 12-year-old Jamie discovers the game that is being played with his home world, he is extracted from the game and made a Homeward Bounder. He must travel between the worlds, searching always for his own, original world. If he finds it, he will be allowed to re-enter the game. But until he does, he is forbidden from playing. And so the stage is set for a picaresque tale in which Jamie has lots of exciting adventures. He encounters the Wandering Jew, the Flying Dutchman and other semi-mythical beings. The ending is bitter-sweet. I won’t spoil it for you, but it is yet another example of Diana Wynne Jones’ ability to be both poignant and very moving and one and the same time. JANE: Thanks! I think I missed this one. I’ll need to put it on my list. ALAN: Some of Diana Wynne Jones’ protagonists are quite young children, and the books in which they appear seem to be written to appeal to a younger audience. Two particularly good ones are Wild Robert and The Game. Both are very short, novellas rather than novels. I suspect this is because they are intended for a younger age group. But there is never any feeling of “talking down” in the prose, and she makes no concessions in terms of the complexity of her plots. Consequently this 65-year-old child enjoyed them a lot! JANE: I haven’t read Wild Robert. Can you tell me about it? ALAN: Yes indeed. It tells the tale of Heather who lives in a stately home. She hates the constant stream of tourists and, in order to escape them, she plays on an old burial mound hidden away in the grounds. There she accidentally conjures forth Wild Robert himself. He is arrogant, spoiled, powerful, and 350 years old. For Heather’s sake, he plays pranks on the hateful tourists so as to drive them away. Although Heather is nominally the protagonist, once Robert appears, he seems to take over the book from her! His practical jokes are clever, funny and always very appropriate. It’s a wonderful wish fulfillment story. JANE: I need to add that one to my list. I did just read The Game, but I’m betting our readers have missed it. Why don’t you tell them about it? ALAN: In The Game, we meet Hayley who lives with an Aunt in Ireland. There, she and the other children play a game in a world they call the mythosphere. The name gives the plot away. The novel is simply (simply? Diana Wynne Jones books are never simple…) a re-telling of many Greek myths in much the same way that Eight Days of Luke was a re-telling of the Norse myths. But because this is Diana Wynne Jones, there’s rather more to it than that. JANE: Funny, I found there was a lot more to the mythosphere than simply Greek myths… I’ll leave it to our readers to decide for themselves. Meanwhile, you mentioned above that Diana Wynne Jones finds parallel worlds a fascinating concept. I have a theory as to why this might be so. However, maybe we should save that for next time! This entry was posted on April 23, 2015 at 1:00 am and is filed under Thursday Tangents. You can follow any responses to this entry through the RSS 2.0 feed. You can leave a response, or trackback from your own site. In the past week, I’ve read the Dalemark books, the Derkholm books, three Chrestomanci books, and Eight Days of Luke. I’m starting to wish I’d exercised less restraint and just emptied the library shelf into a bag and ran out the door. I’m finding Diana Wynne Jones to be an incredibly engaging and creative writer. All the books I’ve read so far have been so much fun! Thanks for introducing me to her (some people never get the word).